A century ago, as the patriotic fervor from World War I began to subside, students at Washington State College found themselves uninspired by the songs associated with their school, according to university archivist Mark O’English. Two senior music majors, Zella Melcher of Spokane, Wash., and Phyllis Sayles of Lapwai, Idaho, took on the task of writing new music to energize the student body. Soon to be 100 years old, the Washington State Fight Song is the Cougar Nation’s familiar and much‑loved anthem. 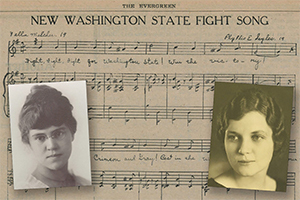 A new exhibit at WSU’s Manuscripts, Archives and Special Collections celebrates the iconic song as well as the two women who wrote it. “Win the Day for Crimson and Gray: Celebrating a Century of the Fight Song” opens with a reception 3–4:30 p.m. Thursday, Jan. 17, at MASC in Terrell Library. The exhibit is open for viewing during MASC’s regular hours, 8:30 a.m.–4:30 p.m., Monday–Friday, and will remain up through the final full week of April.